I offer year-round snapping lessons in the Ohio Valley, parts of West Virginia and the Pittsburgh, PA area. I was a long snapper/tight end at West Virginia University and Indiana University of Pennsylvania. I am the Special Teams/Linebackers Coach at Division 3 Bethany College in West Virginia and offer private snapping lessons through Kicking World as well. Snapping Coach at Kicking World since 2015. 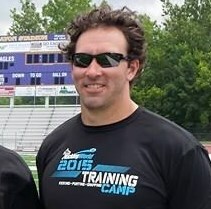 Special Teams Coach at Bethany College 2013-Present. B.S. in Health & PE, West Virginia University 2004. Offers year-round private snapping lessons in the Ohio Valley. Spending time with my wife & son, and playing golf. I am available on most weekends and weekday evenings for 1 on 1 snapping lessons. My location is easily accessible from various parts of eastern Ohio, West Virginia & Western Pennsylvania.